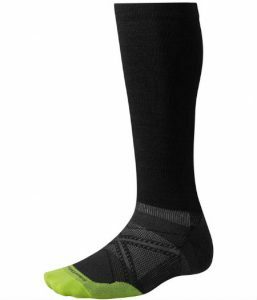 The ‘Smartwool compression sock’ is a piece of compression wear that features a smart Merino wool material, designed to keep your lower legs warm and secure. I first came across this product while looking for something that I could wear to keep my feet warm whilst fishing. Standing up for 14 hours straight usually results in stiff and tight feet/calves. These socks, by Smartwool, ensure that my lower legs are kept warm; they also provide great support for my ankles when walking over bumpy terrain. Below is a detailed Smartwool compression socks review, read down to see my thoughts on this promising product! Upon delving deeper into the brand, I found out that it was originally founded by two ski instructors, back in 1994. In the year 2005, the company was acquired by ‘The Timberland Company’, who are famous for their high-quality boots. This gave me instant confidence in the brand and I could really feel a sense of quality. SmartWool supposedly gave their products a clever treatment that makes all products itch-free and resistant to shrinking. SmartWool has also claimed that their products feature a moisture-wicking performance (draws sweat off of your skin and transfers it to the outside of the fabric) and odor-reducing technology. The brand has obviously put a huge amount of work into designing the product and sourcing the materials. Smartwool seems like a brand that loves to push the boundaries; you will see this displayed throughout the rest of my review. 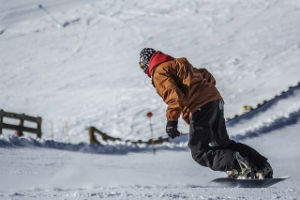 The product is primarily designed with skiers in mind. The socks are to be worn over your feet and underneath your ski boots. Mesh ventilation technology ensures that your feet never get too hot and allows them to breathe easily. The socks are fitted with a ‘Virtually Seamless™’ toe, Smartwool claims that this will provide “ultimate comfort” in your ski boot. 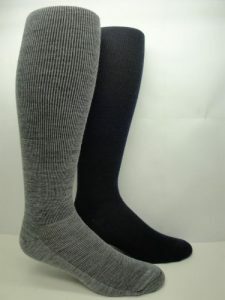 The socks have been made by using a 200 needle construction process; this provides ultra high knit density. The sock is to be pulled up over the calf muscle, keeping your lower leg muscles warm and secure. This guy goes into detail as to how these socks work. If you’re keen on learning that, then go ahead and watch. This product is primarily for those of you who enjoy partaking in sports that are based in cold locations, specifically skiers/snowboarders. Although the product was originally designed for skiers, it can actually be worn by anyone, even nurses, and is a well-regarded compression sock in its own right. The compression sock actually comes with a number of benefits; this means that there are quite a few situations in which I would recommend using it. If you partake in sports, especially in cold environments, then this product will help to keep your muscles warm and compact. The Merino wool element to these socks is a big improvement over the usual fully-nylon socks that are on the market. The Merino wool gifts you with extra comfort and warmth. The socks even feature an ‘Indestructawool™’ technology, this trademarked material means the socks have great durability and are perfect for people who take part in highly physical sports such as skiing, snowboarding, and hiking. Not speeding down the slopes of the French Alps? Don’t threat, this product may still be the one for you. The compression ensures that the wearers’ muscles are fully warm and ensures that your ligaments are secure and less prone to injury. This is absolutely perfect if you have any previous injuries or even slight niggles. 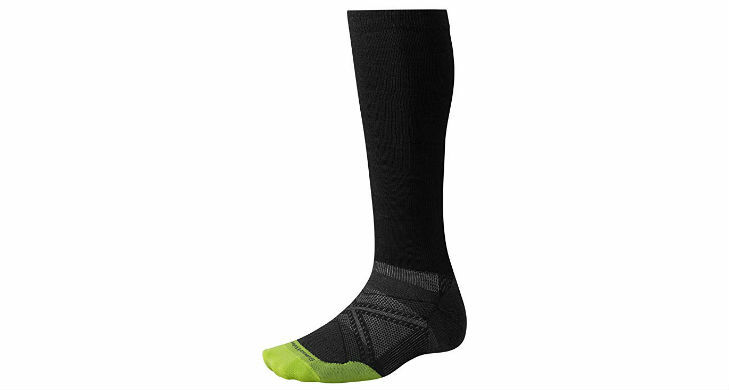 The Smartwool compression sock is remarkably reasonably priced. They are roughly the same price as the other similar products currently on the market, yet a very high-quality product at the same time. I won’t mention the exact price as it does vary based on the store. They can be found here on Amazon.com. Smartwool has clearly put a lot of work into their products, especially when it comes down to the materials. I love this. This is shown by the sheer amount of active trademarks that they have protecting this product. The materials used are a very high quality and are revolutionizing the compression industry. The socks have a perfect amount of compression, well for me, and many others. This may not seem like a massive plus, but I assure you that ‘tightness’ is a significant factor when choosing a compression sock. It is fairly difficult to give negatives in this Smartwool compression socks review. It is simply a high-quality product that does what it is supposed to. On harsh assessment, I will have to mention that the material can lose some of its ‘fit’ after a while. If you are planning on wearing these while running long distances then you may experience that they start to fall down your leg. They are perfect for injuries but not so perfect if you are using them for a vast amount of wear; as they will not last you as long. If ultra warmth is of significant importance to you then I would recommend the SoxShop Merino Wool Socks; these socks actually contain more Merino wool than the Smartwool version. The socks also feature a thick cushion for added comfort when wearing boots. The socks get very good reviews for their warmth and comfort. It is, however, not so suited to be worn during strenuous sporting activity. Another product worth a mention is the Wanderlust Support Stockings. The company claims that this is a ‘premium quality Merino wool compression sock’. This product does, however, have a much lower quantity of wool at only 9%! The positive of the Wanderlust is that it has added support for the arch of your foot, this is especially important if you have any Plantar Fascia injuries. To conclude the Smartwool compression socks review I have to say that I think this is an all round great product; with many positives and hardly any negatives. The socks are also a fair price. With the sheer amount of added features that this product carries they could easily have charged a much higher price. Instead, they have offered their socks at a price that is fair to everyone. If your feet could do with some added warmth and support then give this product a go. It gets the seal of approval from me.